Alex Kirilloff was drafted by the Twins in the 1st round of the 2016 draft, after hitting .540 with 3 homers and 24 RBI’s over the course of his senior year at Plum High School in Pennsylvania. But Kirilloff wasn’t your typical high school draft pick. Although he played for his local high school team, Kirilloff took classes online throughout his entire four years there, making him just the second home schooled player to ever be drafted in the first round. However, despite having never attended classes on campus, the Twins saw great potential in Kirilloff, and he certainly didn’t disappoint. In his first partial season of pro ball this past year, Kirilloff hit .306 with 7 home runs and 33 RBI’s in just 55 games played, winning the Appalachian League Player of the Year. Although only time will tell if those numbers will continue to translate into the upper levels of the minors, if Kirilloff can keep his hitting going into the coming years, he could be playing in Minnesota in the not so distant future. My father was my biggest baseball influence growing up. He always tells me about how the first day I was able to stand up and walk he was already showing me how to hit off a tee. I’ve always had an interest for baseball growing up for as long as I can remember, really. Being surrounded by it kinda led me in that direction. Josh Hamilton was probably my favorite baseball player growing up. He captivated me — watching him hit 28 homers in a single round of the 2008 Homerun Derby at Yankee Stadium. I also have read his book. His story is a great example of how even Christians are not perfect. His battle with alcohol and drugs just goes to show what the devil can do to us if we aren’t always careful. Josh’s testimony is tremendous, and I would suggest reading his book Beyond Belief to anyone. 3.) You were drafted by the Twins in the 1st round of the 2016 draft. What was that process like for you? Where were you when you first found out? Initial thoughts? Being drafted by the Twins is truly a blessing. The process throughout high school was long and tedious at some points, but it was all worth it. When I first found out, my teammates, friends and family were all at a local restaurant watching the draft. My initial thoughts were how excited, honored and blessed I was to get selected by them. 4.) In 2015, before you were drafted, you won the Perfect Game All-American Classic Home Run Challenge in San Diego, hitting 34 home runs over the course of the competition. With the power you possess, how important do you consider power-hitting to be in regards to your overall gameplay? I think the power is a growing part of my overall gameplay. I would hope that the older I get and the more I mature, I hope the power will become more and more relevant. Overall, though, it’s a huge part of hitting to be able to hit doubles and home runs, so I hope to continue to do that. 5.) You were the first high school player since Joe Mauer the Twins immediately sent to Elizabethton to begin their professional career, completely skipping the Gulf Coast League. What type of changes did you find yourself having to make to adjust to the differences between high school and professional baseball? There are a lot of adjustments to be made from high school to pro ball. The game speeds up a lot; you are getting challenged every at-bat; you are playing every single day; you have to take care of your body better; and you have to be mentally focused everyday. 6.) Despite being sent straight to the Appalachian League, you immediately excelled, going on to win the Appy League Player of the Year for 2016. What did it mean to you to have such a successful start to your pro career? It meant a lot to get my career started on a good note. I felt that it was reassurance from the Lord that this truly is His plan for me and the avenue that He would like me to impact people through. 7.) Talk a little bit about life on the road: What’s the most difficult aspect of it? What do you do to pass the time? Bus rides are usually not exactly the highlight of going on a road trip. Most of your down time is eating and sleeping, to be honest. Again, that’s just another adjustment that has to be made playing pro ball. 8.) Although you had time after signing to play in just 55 games, what do you feel went well in 2016? What are your goals for 2017? I just think my adjustments to the whole situation went pretty well in 2016. I am always looking to improve though and, Lord willing, do better in 2017. Favorite TV show is ‘Intentional Talk’. Favorite food is steak. My advice would be that if you are serious about your dream of playing baseball, and that it is what you feel the Lord wants you to do, it takes a lot of work. Training, discipline and motivation are all big keys along the way. Putting yourself in different opportunities to be seen by people is important as well, believe it or not. Big thanks to Alex Kirilloff for taking the time to answer my questions. It’s been said time and time again by myself and other people around baseball, but it’s worth repeating: You can’t always take a team’s or player’s hot or cold start to a season in stone as to how they will perform over the rest of the season. The Orioles are off to a surprisingly good start (their best since 1970). While their team has the ability to win often, I would never have guessed that they would be the only undefeated team remaining in baseball a week into the season. Chicago, on the other hand, is off to the great start that people around the baseball world predicted, and are well under way to their World Series destiny. Like Baltimore, the Reds are also over performing tremendously. Them kicking off their season 5-1 isn’t how I ever thought things would pan out for them. None of these three were household names before the season got underway, but they are each posting numbers that would qualify them as such towards the end of the season. Tyler While is absolutely on fire for the Astros, as is Eugenio Suarez for the Reds. Both will look to continue to lead their given teams. However, while they are each off to hot starts, the talk of the baseball world is Trevor Story. Although Story has numerous players ahead of him in the batting average department, I included him on this list because of his historic seven homers over the course of his first six career games. It’s not all that surprising that these three teams are at the very bottom of the pack among the other 27 teams in the baseball standings. Despite an unbelievable season last year, in which the Twins proved many people wrong, they are off to the worst start in their franchises history. The Braves aren’t faring any better, having yet to win a ballgame, with the Marlins having notched one victory, but still not seemingly on the verge of postseason glory when October rolls around. Having yet to record a home run isn’t all that rare this time of season, nor is it unheard of to have recorded hits that didn’t result in a single run batted in. But to be hitting below .100 at any point in the year is a clear sign that your bat has gone ice cold. That’s certainly the case for Curtis Granderson, who is hitting just .050 on the year to this point. Logan Morrison is not far behind, with a mere .056 average, with teammate Brad Miller hitting just .059. While they will each inevitably raise their averages as the season goes on, it’s certainly not the start they were hoping to get off to. As you can see, there are tons of teams and players who are off to amazingly great starts, with others having yet to show up. Over the course of the 162-game season, the majority of teams and players will inevitably wind up close to where they were predicted to end up before the season began (given, there are always a few surprises). But even so, it’s always fun to take a look to see what kind of start players and teams get off to when any given season begins. How long it lasts is the part that will be intriguing to watch. 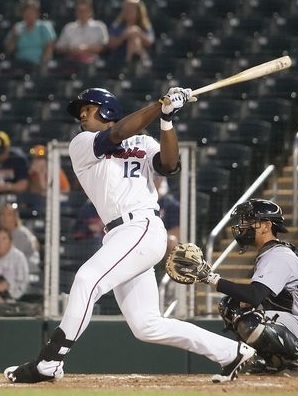 Adam Brett Walker II was drafted by the Twins in the 3rd round of the 2012 draft, after batting .343 with 12 home runs and 42 RBI’s in his Junior season at Jacksonville. Since the draft, Walker has posted some good numbers, with his best season thus far coming back in 2013, when he blasted 27 home runs and drove in 109 runs to go along with a .278 batting average. This past season, Walker saw his number fall a bit, batting only .246 and driving in 15 fewer runs than the previous year, but he still managed to knock 25 balls over the wall throughout the year. With power being the number one tool that Walker possesses, it’s likely that his home run totals will be the one thing that stands out from season to season as his career progresses. A right handed power hitter, which is currently one of the most prized assets at the big league level, it shouldn’t be too long before Walker sees himself up in Minnesota with the Twins if he can continue to record solid numbers. I have been playing baseball since before I can remember. I’ve [played] organized ball since tee ball. My dad loves the game as well, so he let me play baseball along with other sports. My cousin Damion Easley played in the big leagues, and I have always looked up [to him] as someone I know that can make it. My favorite player growing up was always Ken Griffey Jr. I love the way he played the game. It always looked like he was having fun, and I love his swing. 3.) You were drafted by the Twins in the 3rd round of the 2012 draft. What was that process like for you? Where were you when you first found out? Initial thoughts? It was a very exciting feeling for my family and I. I was sitting at home and some of my family came into town to be with me. It is a pretty crazy feeling to sit there and listen to other names getting picked before me. When the time came and I finally heard my name called by the Twins it was very emotional for me, knowing that I have worked my whole life training to have this opportunity. I dreamed of having this chance for my whole life and it was an amazing feeling. 4.) Talk a little bit about life on the road: What’s the most difficult aspect of it? What do you do to pass the time? Life on the road isn’t the most fun but it helps a lot to have been with such great teammates during my professional career. We spend a lot of time on the bus traveling during the season, that is for sure. You really start to find ways to entertain yourself, from watching movies, listening to music, reading, and playing cards with the guys. It definitely isn’t the most idea way to spend hours of your time every couple days, but I wouldn’t have it any other way. 5.) Known for your power, you won the 2014 Florida State League’s All-Star Game home run derby. Did you approach the derby with any different of a swing than you do in an at-bat during the season? After the derby, did you notice a negative change in your swing that many big league home run derby participants complain about? I had a blast this year in the Florida State League home run derby. I didn’t try to change too much in my swing, though. When we take BP during the season I usually try to take a few swing and have my own home run derby. I definitely swung a little harder during the home run derby than I do in game, though. Of course, I was trying to pull the ball in the derby, so the main adjustment I tried to make after was making sure I could hit the ball to the opposite field. After the All-Star break, I don’t believe that being in the home run derby hurt me. 6.) You made it to the playoffs this season with the Fort Myers Miracle, winning the Florida State League title for the first time in their franchise history. What was the overall experience of the playoffs like? This year has been a lot of fun for me, so to be able to end the year with a championships just makes it so much better. We had a great team this year, and we were all pulling together to win the league. I had a great group of teammates to play with throughout the summer, so to win with them was awesome. I love playoff baseball, though. The intensity of the games is unbelievable. We all know that every game is going to come down to executing the last out every game of the series. I just hope to be able to experience playoff baseball a few more times in my baseball career. 7.) Is there any one stat that you pay attention to throughout the season? Or do you try to steer clear of them altogether? I try to stay away from checking out the stats. Every night I just try to go out and do what it takes to win the game. I know if I’m helping the team then my stats will be in a good spot at the end of the year. Winning baseball games makes the season a lot easier to handle as well. Even if you are doing great but your team keeps losing day after day it is still hard to be happy. 8.) What do you feel went well in 2014? What are your goals for 2015? 2014 was a pretty good year overall. There were ups and downs throughout the season but I am happy now looking back at it. I believe I did a pretty good job of driving the ball and being able to bring in runs. Run production is a big part of my game, and I take a lot of pride in doing that. I will always keep working on being a better defender and having more plate discipline. That is always a goal of mine going into every season. I have felt I have grown in these aspects of my game, but feel I could still be better. Having plate discipline will help cut down on strikeouts, and I believe help [me] be able to get on base more. I don’t watch a whole lot of TV but I am a big Netflix guy now. I just finished watching ‘How I Met Your Mother’. I loved watching that show, so I’m pretty upset that it is over now. I can’t lie, I am a pretty big fan of watching some HGTV every once in a while. My favorite food is pizza, though, by far. I love it all and I could eat it everyday! My advice to kids that have dreams of playing professional baseball is to always have fun! I think about how when I was little all I wanted to do was go out and play with my friends. I know as I got older I started putting more pressure on myself to perform, which is good because you want to be the best you can be. I have had times when I was doing well and I looked back and I wasn’t having fun. I was putting a lot of pressure on myself and had to step back and enjoy the game and take it one day at a time. You will have to work hard but remember you are playing the game you loved for so long. Never forget that. Big thanks to Adam Brett Walker II for taking the time to answer my questions. The players who are planning to blast long balls in the 2014 home run derby were fully announced on Thursday, and, for the most part, I’m not extremely shocked with any of them. My original picks only included three of the selected players I wanted to see in the derby, but the new format for the home run derby (ten players instead of eight) threw me off when it came to making my selections. My initial list included eight players, being Nelson Cruz, Edwin Encarnacion, Jose Abreu and Yoenis Cespedes (Jose Bautista hadn’t yet been announced as the captain) for the American League, with Giancarlo Stanton, Evan Gattis, Carlos Gomez and Yasiel Puig (Troy Tulowitzki hadn’t yet been announced as the captain) for the National League. In the end, American League captain, Bautista, selected Brian Dozier, Adam Jones, Josh Donaldson, and defending derby champion, Yoenis Cespedes. On the National League side of things, their captain, Tulowitzki, added Yasiel Puig, Todd Frazier, Giancarlo Stanton and Justin Morneau to the mix. All in all, a very solid group of players; though I would’ve liked to have seen rookie phenom, Jose Abreu, compete (he expressed that he wasn’t interested in participating). Round 1: Five players from the American League and five players from National League compete to see who can hit the most home runs, receiving seven outs instead of the previous ten (they receive the same number of outs in every following round). The top slugging player from each individual league receives a bye, jumping automatically ahead to the third round, and subsequently giving them added rest that they’ve never been rewarded with before. The second and third place hitters in the round from each league will then move onto round two, with the bottom two pairs of players being eliminated (four total). Round 2: With the top home run hitter from the American League and the top player from the National League in the first round skipping round two, this round sees two American League hitters and two National League hitters (the second and third place finishers from round one) squaring off. The two winners will subsequently move on to round three to take on the round one winners. Round 3: The sole winner from the American League and National League in round two of the derby is set to take on their respective league’s winner from the first round. The player from the AL who hits the most home runs in this round will move on to the final round where they will compete against the round winner from the NL. Round 4: For the first time ever, there is going to be a round four added to the mix. This round will see the winners from round three (one from the AL and one from the NL) going head-to-head for the title of 2014 MLB Home Run Derby champion. With the number of great power hitters that are always in the mix at this point in every derby, it’s sure to be an entertaining round. Overall, I like the changes to the derby format. Allowing the winners from the first round to skip the following round finally gives them an advantage and motivation to try and put on a show. In the past, a lot of players have hit their stride in a round (Josh Hamilton slugged a record 28 home runs in the first round back in 2008 only to tire out and lose the derby) that ended up costing them the derby due to fatigue. A break to give them a chance to regain their energy should make things more entertaining for the players and the fans. With the field for the home run derby set with its full slate of ten players, and with the new format for this year’s derby fully explained, I wanted to take a second to give my thoughts on how I feel the derby will go. Round one is going to be a very interesting round. Basically being unpredictable, just about any of the players on the American League side of things has the ability to get hot and win the round. With that said, however, I feel that it’s most likely going to be Jose Bautista. Though he doesn’t have the most power of the group, he has a good combination of an ability to hit for power and total homers to do well. Coming in second and third I see it being Yoenis Cespedes and Adam Jones, meaning Josh Donaldson and Brian Dozier would be eliminated. With Jose Bautista having won round one in my mind, this round would have Yoenis Cespedes going up against Adam Jones. Though Adam Jones can hit with the best of them, I’m sticking with last year’s winner, Yoenis Cespedes. Next to Giancarlo Stanton in the National League, Cespedes has arguably the best power in the derby, and should be able to make it to round three, with Jones getting knocked out. The final round for the American League portion of the derby would then see Yoenis Cespedes hitting off against round one winner Jose Bautista. Though somewhat difficult to predict, between these two, I’d have to move Cespedes to the championship round, just beating out Bautista. Likely to be the more impressive round one show between the two leagues is the National League. With Giancarlo Stanton in the mix, I truly don’t see anyone as having a chance at beating him out in this round. That leaves Troy Tulowitzki, Yasiel Puig, Todd Frazier and Justin Morneau, and I feel that of those, Tulowitzki and Frazier stand the best shot at advancing, even with the always entertaining Yasiel Puig in the running. That would leave Puig and Morneau as the players to be out hit in the first round. With there a good chance that Giancarlo Stanton will have destroyed the completion in the initial round, the second round would include NL captain, Troy Tulowitzki, taking on Todd Frazier. Though Frazier has hit his share of tape measure home runs over the course of his career, I don’t think he will have enough to overtake Tulo. And thus, it’s likely that Tulowitzki will move on to face Stanton in the next round. After skipping the second round, Giancarlo Stanton would be taking on the previous round’s winner, Troy Tulowitzki. While anything can happen in a home run derby, and certainly has in the past numerous years, I don’t think Stanton will stumble in his quest for the championship round. If the final, championship round of this year’s home run derby is in fact Yoenis Cespedes and Giancarlo Stanton squaring off, it’s sure to be one of the best final rounds ever. Both Cespedes and Stanton have unbelievable power, and both have the strength and ability to put on long, amazing displays of power. Honestly, the final round could easily go either way, but to stick with my gut, your 2014 Major League Baseball home run derby champion will be Giancarlo Stanton, as many are already predicting. After winning over 20 games last season and picking up the 2013 American League Cy Young Award, it’s hard to believe that Max Scherzer had never thrown a complete game over the course of his seven-year career heading into Thursday night’s start against the White Sox. But after 178 previous starts without achieving the feat (the longest streak of any active pitcher without their first complete game), Scherzer was finally able to go the distance against the Sox, outpitching the equally dominant Chris Sale, throwing 113 total pitches over his nine innings of three hit, shutout baseball (it was Scherzer’s first career shutout as well) on the mound. Moving to 8-2 on the year, with an ERA of 3.05, Scherzer’s great start helped to stop the Tigers’ three game loosing streak as well as put a little more room between them and the White Sox in the American League Central standings. When playing a division rival it becomes even more important to pickup the victory, and Scherzer made sure that happened. One of only two divisions in all of baseball with less than ten games separating the first and last place teams (a mere four games separate the Twins at the bottom from the Tigers at the top), the Tigers are looking to begin turning around a somewhat disappointing year by their standards. With the team the Tigers possess (Miguel Cabrera and Victor Martinez on the offensive side; Justin Verlander and Max Scherzer on the pitching side) many people agree that they should be running away with the division as they had been predicted to do. But despite their strong team on paper, not a lot has been going well for the Tigers this season. Justin Verlander — once one of the most dominant pitchers in all of baseball — and Joe Nathan — once one of the most dominant closers in all of baseball — are both trying to figure things out, along with the majority of the Tigers’ pitching roster. With their lineup being hit or miss on any given night (except for Miguel Cabrera, who’s having a great year despite a slow start, and Victor Martinez, who’s having a career season), it’s still going to take a lot for the Tigers to begin increasing their current lead. 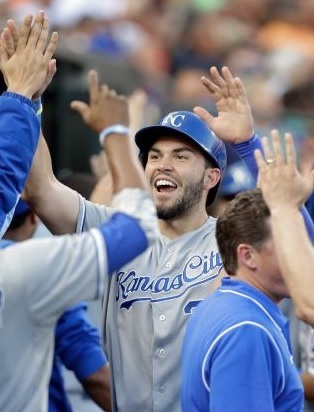 Although the Tigers currently sit atop the division, they hold only a two game lead over the Royals. With the Royals on a four game winning streak, and the White Sox, Indians and Twins all within a few games of first place, the Tigers shouldn’t be panicking quite yet, as there’s still plenty of season remaining. However, they need to pay close attention before things get too far out of hand. With such a small margin separating the Tigers, Royals, White Sox, Indians and Twins in the division, no matter how you look at it, any team in the American League Central currently has a chance at finishing in first place at the end of the season. While it’s a long shot at best for a couple of the teams, if the Tigers want to be the division winners, they’re obviously going to have to start playing better. 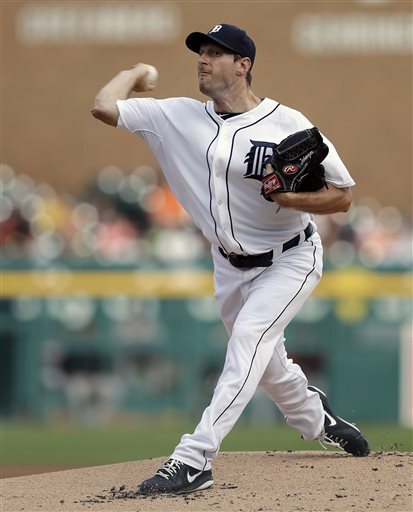 But if Max Scherzer’s dominant outing was any sort of sign of what’s to come, the Tigers could easily begin to pull away from the rest of the pack in the upcoming weeks before the All-Star break.